Malibu Creek is the only stream that transects the Santa Monica Mountains. Its headwaters are in the mountains north of the range divide. It must have existed here before the mountains did and cut its canyon as the mountains rose. Entry into the canyon is via County Road N1 from PCH alongside the Pepperdine University. The campus is situated on northwest-dipping, variegated sandstone beds of the Sespe Formation (Oligocene) overlain by lower Topanga Formation sandstone (Miocene). About a mile or so up the canyon, the highway crosses a buried thrust fault and then goes into a deep gorge where the stratigraphic section is repeated. About 4 miles up the canyon near its intersection with Piuma Road, County Road N1 passes from the sedimentary section into a 2-mile-long stretch of interbedded lava flows and breccia of the 16- to 13-million-year-old Conejo Volcanics. These extrusive rocks erupted both on land and in the sea in middle Miocene time. Outcrops of the volcanic rocks in the western Santa Monica Mountains are typically unstratified dark brown breccias and highly fractured lava flows. 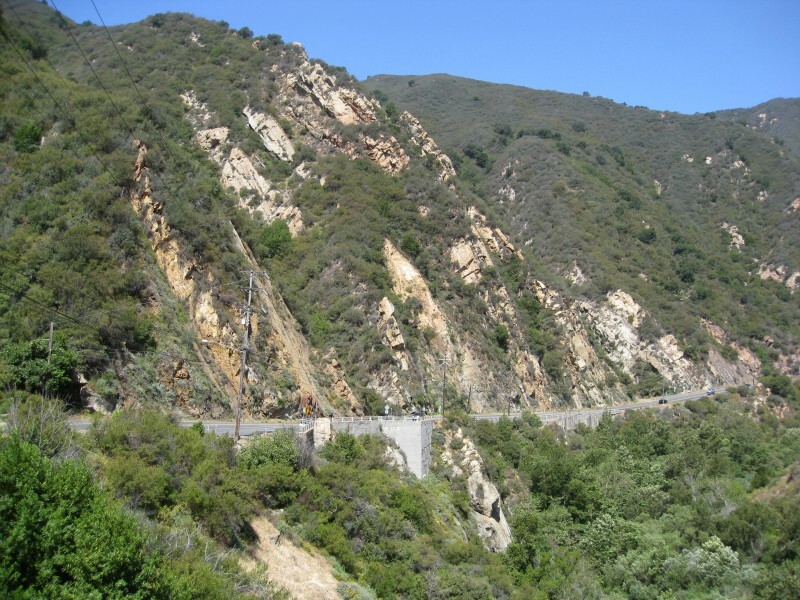 Near its intersection with Mulholland Drive, County Road N1 goes down the north side of the Santa Monica Mountains via an alluvial valley lying in a syncline of upper Topanga Formation. You won’t see outcrops along this stretch of road until you are within 1 mile of US 101.